A new study provides important insight into the evolution of sleep and how we might build a brain that does not need to sleep. Blind Mexican cavefish (Astyanax mexicanus) pictured on the top and a surface fish pictured on the bottom. Nearly all animals studied need to sleep, but little is known about why some animals sleep most of the day, while others sleep very little. As a result of living in total and permanent darkness in a small location in northeast Mexico, the eyeless, tiny blind Mexican cavefish (Astyanax mexicanus) has evolved sleeplessness, snoozing far less than their river-dwelling relatives. These fish have been studied for nearly 100 years for their fascinating traits, yet little is known about how their behavior evolves. Because of their lack of sleep, they provide a great model to study human sleep disorders such as insomnia. A new study published in eLife by neuroscientists in the Charles E. Schmidt College of Science at Florida Atlantic University is providing new insight into the evolution of sleep. For the study, the researchers found that the neuropeptide Hypocretin, previously implicated in human narcolepsy, is expressed at higher levels in the cavefish brain. While loss of Hypocretin has been shown to cause narcolepsy in human and animal models, cavefish evolved to have higher levels of Hypocretin resulting in sleeplessness. The team of scientists, led by Keene, set out to uncover the mechanics behind sleep loss in A. mexicanus to find out more about how deficiencies in Hypocretin signaling are associated with altered sleep and narcolepsy, a chronic sleep disorder that causes overwhelming daytime drowsiness, in diverse vertebrate organisms. To accomplish that, Keene and his team conducted a comparative study among A. mexicanus surface and cavefish brain cells. Their results show that the number of Hypocretin cells in cavefish is significantly higher than that of their surface-dwelling relatives. Hypocretin, previously implicated in human narcolepsy, is expressed at higher levels in the cavefish brain (A. mexicanus). 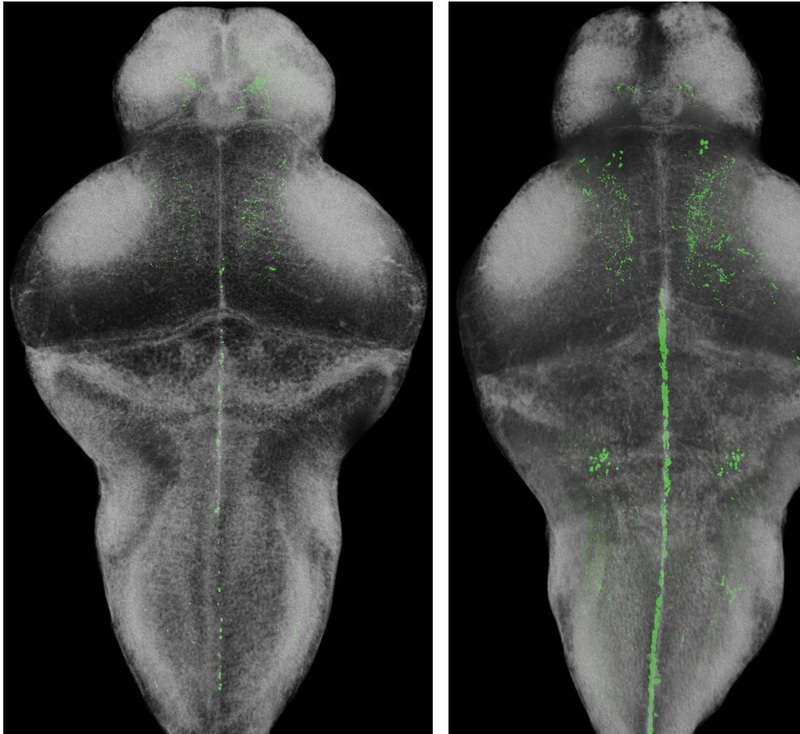 Brains of surface fish (left) and cavefish (right) with wake-promoting Hypocretin protein depicted in green (bottom). Next, they showed that inhibiting Hypocretin signaling, genetically or pharmacologically, increased sleep in cavefish, while it had very little effect on surface fish. Study co-authors are Erik Duboue, Ph.D., an assistant professor of biological sciences in FAU’s Harriet L. Wilkes Honors College, and David Prober, Ph.D., a professor of biology at the California Institute of Technology. “Hypocretin Underlies the Evolution of Sleep Loss in the Mexican cavefish,” can be freely accessed online at https://elifesciences.org/articles/32637. This study is supported by award 25762 from the National Science Foundation to Keene.